Most Internet users strive to have a reliable network connection to the Internet, as it enables them to enjoy what it has to offer without most of the issues that may occur otherwise. If you are a gamer, you may want to avoid lag more than anything else, while P2P users may dislike throttling and users who stream media the dropping of packets. If you are a network administrator, or a developer whose creations rely on network connections, you may want to test how it behaves when conditions worsen. What happens to your app when you are experiencing lag, drops or throttling? Are those events properly taken care of, or will they crash the service or application instead? Clumsy for Windows has been designed to provide you with the answers to that. The free program, available as a 32-bit and 64-bit version, can simulate bad network connections. When you start the portable program after unpacking the graphical user interface that you see on the screenshot above launches. The top lets you select a preset for your tests, for instance all IPv4 localhost traffic, all sending packets, or against specific IP addresses. Below that are the functions that Clumsy makes available. Lag emulates network lag based on a time in milliseconds that you can define in the options. Drop drops packets randomly based on a chance percentage that you specify. Throttle blocks traffic for a certain time frame and sends it in batch afterwards. 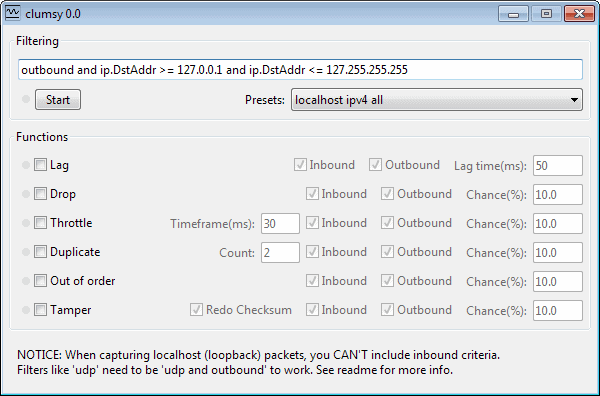 Duplicate sends cloned packets after the original packet. Out of order changes the order of packets. Tamper tampers with packet contents. Some functions have additional parameters that you can define. If you want to throttle, you can specify the time frame in addition to the chance of it happening. For the duplicate function, you can define the count of packets, and for tamper, to redo the checksum. To use the program, select the functions that you need for your tests, and click on the start button afterwards. The button turns into a stop button that you can use to stop the simulation at any point in time. If you want a function to have effect all the time, raise the chance to 100%. You can select multiple functions if you want to test the impact of more than one on the network condition (e.g. lag and dropped packets). Clumsy does work if you are offline. It works with any application running on the system. The source code of Clumsy has been made available as well, and a manual has been created as well which lists limitations and how to use the application. Clumsy is a specialized program for system and network administrators, and developers. It can be used to test how services or applications behave when network conditions are not ideal. I have been wanting a program like the one described by this article, but with WIndows 2000/XP support. I have tested that the Clumsy software aborts on Windows XP. Well I wonder why would we need such a program with the terrible internet connections nowadays haha. Now seriously, thanks for your post. I didn’t know about clumpsy and seems to be very fully featured.